The Fractal Art world is an odd place. The strange combination of technical people (mathematicians, engineers, programmers) and artsy, creative people is curious and could almost be the setting for a mystery novel. My wife once told someone at work about my fractal hobby and said they were really impressed after visiting my website that I knew so much about chaos theory and fractal math. Hmmn… I wondered, why would they think I knew anything about math? Recently, while looking into things, I came across an interesting association of attributes: science credentials and Fractal Art. I “hmmn-ed” again. What’s all this science stuff got to do with making fractal art? Would it help me if I had such a solid math and programming background as these super stars did? It doesn’t seem to be helping them out too much. The Rocket Scientists are the sword-makers of our artform. They adapt new fractal formulas and all that “chaos stuff”, molding it into forms that are practical and useful in our hands. All our tools come from them, and the tools of the future will come from them also, not from people like me. Moving on. What confuses things is that the “tool-makers” can also perform the role of “tool-users”. But the skills and abilities that lead to good tool making are irrelevant when it comes to using those tools to make art. They might as well be two different people because when the “scientist” takes up the tool he made, he begins the same process of discovery as everyone else who takes up that tool. Building the racing car vs. driving the racing car. Designing the airplane vs. piloting the airplane. Crafting nunchuks vs. swinging them like Bruce Lee. Making a guitar vs. playing that guitar. Sure, the tool maker immediately knows how to operate the tool, and may know an awful lot about operating that tool, but being creative requires more skill than just being able to use the tools. Actually the tool maker may have a handicap: he may think he has an edge over the one who is merely a tool-user and come to think his tool-making experience gives extra weight and an enhanced quality to his artwork. Artistic activities, on the other hand, have psychological challenges (objectively evaluating your work; creative inspiration) that the quantitative sciences have less of. Furthermore, the precision and absoluteness of the quantitative sciences creates a mindset or approach to art that I think can be a stumbling block in the evolving, shifting, combinant and recombinant, alchemical world of art. Fractal math is challenging and requires math skills that one can’t acquire quickly (I’m guessing). Programming is another thing that takes dedication and work to be able to do well, especially when complex operations have to be presented via an interface that is easy to use. But Fractal Art is Art; it’s got its own set of skills and talents, which in the same way, also count for nothing when applied to the world of mathematics. As someone who both writes software and uses it to create images, I tend to agree that you won’t necessarily produce better work just because you wrote the software. I also personally find that a fractal artwork which has some mathematical significance to it is often more interesting to me than one which doesn’t- it’s another level on which the piece can be appreciated. I think it’s clear that creating a fractal formula and creating fractal art involve different skills and attitudes, but I’m not so sure that they are completely disjoint activities, as you seem to suggest. Quite a few of the more prolific formula/program authors are also quite adept artists. But, I guess this assessment is subjective and constantly subject to argumentation, so I won’t belabor it. In any artistic endeavor, it seems that having a good sense of the tool, and to some extent, the science behind it, are necessary elements in creating good art. How good can a photographer be if she doesn’t know something about light and optics? Can a stone sculptor be successful if he doesn’t have a clue about how stone fractures? In your car-driving example, certainly one doesn’t need to know how to build a car to use one to get the week’s groceries, but if one wants to be a great driver, it helps to know how a car works and why. Artistic activities, on the other hand, have psychological challenges (objectively evaluating your work; creative inspiration) that the quantitative sciences have less of. Furthermore, the precision and absoluteness of the quantitative sciences creates a mindset or approach to art that I think can be a stumbling block in the evolving, shifting, combinant and recombinant, alchemical world of art. The ability to evaluate one’s own work objectively is paramount in math and the sciences, and I don’t know that it’s as important in the arts–art is nothing if not subjective. And I don’t see precision and absoluteness as stumbling blocks–it seems that the Old Masters managed to deal with those issues well enough. If art is, at some level, about bringing the artist’s vision into the physical realm, then being precise about it can be quite the benefit. But, it’s certainly possible to lose sight of that vision and get caught up in the numerical side of things, to which I can personally attest. 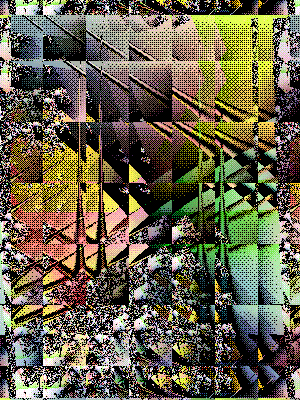 With fractals, I think it’s important for every artist to channel their inner rocket scientist to some level. Not only are we using tools (and every artist needs to know their tools), but the tools are not usually ones that are commonplace (almost everyone has a sense of light or stone), so some study is needed to understand what’s happening. Also, we have the chance to create our own landscapes, not “just” to photograph or paint them. Having a deeper sense of the analytics behind the formulas allows anyone to express their creativity to a degree heretofore impossible. Thanks for the comments, guys. You’re both examples of the Rocket Scientist as well as the artist categories I was speaking of (in fact, I think Kerry actually worked as an engineer for NASA, at one time, if I’m not mistaken). My ideas still need some tweaking and certainly aren’t the last word on this issue. For instance: some tools (programs) may require more technical understanding to use. This blurs the distinction between tool-making and tool-using. Compare Sterlingware and Ultra Fractal (or Gnofract), for instance. Clickety-click vs. Thinkety-think. The creative process may be different? 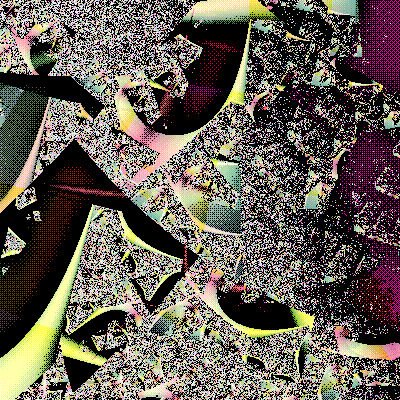 Does understanding the way fractal software works give the artist a creative advantage? Or in reverse: Does the artist have a creative disadvantage if they don’t understand the way the software works? I thought it was something worth raising because I sense that most fractal artists and fractal enthusiasts would say the scientist-artists have an advantage and I wanted to ask the question, “why?” because I didn’t see such a pattern or association when comparing the artwork of both groups. Scientist or not, good art is made by good artists. To be more specific, more complex tools actually give more control to the artist and less to the program itself because in order to open more control possibilities to the user the software naturally becomes more complex. As an example it’s very easy to write a program to do IFS or flames with a simple basic interface so anyone can produce images but very hard to write one with an interface giving a true artist meaningful control over the output. I have noticed that coders often produce lame graphics and I think this is because they have spent most of their time coding instead of learning how to do good looking graphics. Artists, again, don’t know math and programming because they’ve been busy doing graphics. Some people (like Kerry and David and I), however, can do both well. Many good fractal artists have reported that as they learn to harness fractal instruments, their process of creating artwork moves from experimentation to determined. That is, the artist knows what to do and does it instead of just trying out what happens. This is where math and formula writing comes in handy. Fractal formulas are complex intstruments and making that particle red or putting a little texture there may require solid understanding of how the image is (mathematically) composed. If there’s no formula that can do that, you can create one. Programming and math skills allow an algorithm artist to take a proactive approach – if there are no tools to do a specific task, the scientist-artist can create one. But the mathematically handicapped artist can only hope that someone else creates the tools needed.